On occasion I write about disability-related issues. I’d like to briefly step aside from science and share my reaction to a recent announcement that deaf people in New Zealand will soon be able to text emergency calls, reported in an article from The Dominion Post by Claire McEntee. My initial reaction was surprise that it hasn’t been possible until now. I’d always assumed that you could text to the emergency number (111 in New Zealand). It had never occurred to me that you couldn’t. I’ve learnt that there are emergency text numbers for deaf people in a number of countries but in these arrangements, the number differs from the national emergency number, whereas the new service in NZ is to use the national emergency number. For example, individual police services in the UK are advertise texting services, but using local numbers for each region. More recently British emergency services have been testing a national texting service using their national emergency number, 999. Regardless of the issues of priority (who came first) and the fiddly details of how each service works, this news is good to see. See, not hear. Claire McEntee, at the Dominion Post, tells us this new service is to be a registered-user only affair: deaf users will have to subscribe via Deaf Aotearoa New Zealand (DANZ, formerly the Deaf Association; for overseas readers: Aotearoa is the Maori name for New Zealand and translates as ’land of the long white cloud’). The initial service is to the police communications centre, with fire and ambulance services routed via the police text service. Apparently the service will also be able to work in broadcast mode, to issue warnings. The New Zealand Police also initiated engagement with Deaf and hearing impaired groups on the development of services: in particular in the Text to Emergency Communications Centre project, aimed at enabling people to text crime reports and calls for emergency assistance into the emergency communications centre. This work is continuing, with the project to be piloted to Deaf and hearing impaired communities before being rolled out to the general public. 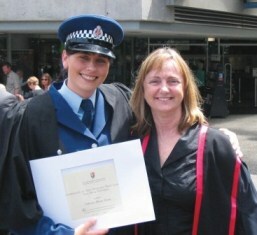 Kudos to NZ Police for acting on this initiative. New Zealand has 79,000 deaf people, according to Deaf Aotearoa New Zealand chief executive Rachel Noble. Other sources indicate approximately 7,500-9,000 profoundly deaf and approximately 250,000 hearing impaired. Either way you look at it, it’s a substantial number of people and this new service will no doubt be appreciated.